U.S. Secretary of State John Kerry said he and Russian Foreign Minister Sergei Lavrov discussed a number of different ways to address the conflict in Syria during talks Wednesday at the United Nations — and came up with some ideas. “Several options were agreed to be further discussed. 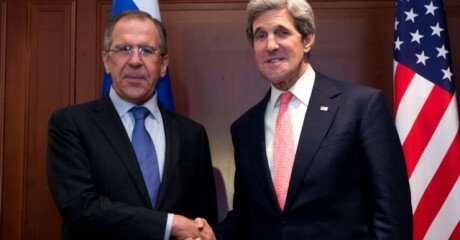 I need to take those back to Washington, to the president and our team,” Kerry said, adding that Lavrov also would discuss the options with Russian President Vladimir Putin. Kerry also said the two men agreed that military officials from both countries needed to talk soon, perhaps Thursday, about ways they could avoid each other while fighting in Syria. Earlier, Kerry said the U.S. would have “grave concerns” about Russian airstrikes in parts of Syria where Islamic State or al-Qaida-affiliated militants are not operating. He commented at a Russian-hosted U.N. counterterrorism forum that took place after Moscow launched airstrikes in Syria’s Homs region. For weeks, Russia has been moving aircraft and other military equipment into Syria in what appears to be a stepped-up effort to help the Syrian regime. The move has put Russia at odds with the U.S. and other world powers that believe a political transition is needed in Syria to help resolve the country’s civil unrest. Lavrov defended his country’s actions in Syria as he chaired the U.N. counterterrorism session. He said Russia had informed other states of its intentions to carry out airstrikes in Syria. He also said Moscow is ready to “forge standing channels of communications” to ensure a “maximally effective fight” against militants, adding that Iran and Russia are among countries that could play a role in that effort. Lavrov said Putin had proposed a U.N. measure that called for coordinating “all forces” fighting against Islamic State and other militant groups. During the session, Syrian Foreign Minister Walid al-Moualem praised Russia’s assistance and criticized the U.S.-led coalition airstrikes in his country, calling them a “flagrant violation” of Syria’s sovereignty. During a U.N. news conference, French Foreign Minister Laurent Fabius laid out what he said were the “conditions for effectiveness” for being part of the coalition against Islamic State. Those conditions, he said, include directing strikes only against the Islamic State and other militants — and not the moderate Syrian opposition. “We need to check whether the Russian strikes that took place today respect this first condition,” he said. He also called for an end to the “absolutely catastrophic” bombings against Syrian civilians. “It is this violence that is being led by Bashar al-Assad that is prompting extremism and the flow of refugees,” said Fabius. The U.S. and some European powers have said they would consider using the P5+1 structure that negotiated the Iran nuclear deal to address Syria’s crisis. The P5+1 consists of the five permanent members of the U.N. Security Council and Germany.